This morning NVIDIA announced a new gaming bundle for their top GPUS. New buyers of GTX 980, 970, 780 Ti, or 780 desktop GPUs qualify for the offer, along with any purchases of notebooks with GTX 980M or 970M GPUs. The bundle features three games from Ubisoft, all of which make use of one or more of NVIDIA's GameWorks libraries and which are part of NVIDIA's The Way It's Meant To Be Played program. To quickly run through the games and technologies, Assassin's Creed Unity features support for HBAO+, TXAA, and PCSS. One interesting note regarding Assassin's Creed Unity is that we've heard it will have a frame rate cap of 60FPS, which is unfortunately becoming more and more common on multi-platform releases. Next up, Far Cry 4 also features support for HBAO+, TXAA, and PCSS; it adds NVIDIA's updated Godrays technology along with HairWorks. The Crew is the third option, a racing game that makes use of HBAO+ and TXAA technologies. All of the games also feature "enhanced 4K support", which basically means 4K rendering has been tested and performance optimizations are in place to make it more usable. For those of you that don't keep up with acronyms, HBAO+ (Horizon Based Ambient Occlusion) is an alternative to SSAO (Screen Space Ambient Occlusion) that helps with rendering more realistic shadows. TXAA (Temporal Anti-Aliasing) is an alternative to MSAA (Multi-Sample Anti-Aliasing) or SSAA (Super-Sample Anti-Aliasing) that combines MSAA techniques with custom filters to reduce the appearance of jaggies; in particular it can help with jaggies that aren't on the edges of a polygon. PCSS (Percentage Closer Soft Shadows – PDF link) is a way to improve the look of shadow maps by softening the shadows based on how far an object is from a surface. Next, we've seen Godrays in various forms for a while, and the latest iteration apparently uses tessellation to project transparent polygons (from the shadow maps) that can then be lit up to provide more realistic looking rays of light. Finally, HairWorks uses tessellation to dynamically render potentially hundreds of thousands of strands of hair in place of detail textures. Also worth note is that while TXAA and HBAO+ are restricted to NVIDIA GPUs, the Godrays, HairWorks, and PCSS libraries are (I believe) GPU platform agnostic. You can get more information on the Pick Your Path promotion on NVIDIA's site. As for the games, Assassin's Creed Unity is slated for launch on November 11, Far Cry 4 follows a week later on November 18, and The Crew has a release date of December 2 (according to Steam). All three games have a current MSRP of $59.99, so if you're already looking at a GTX 970 and one of these titles that's a nice discount. There's no indication how long the promotion will run, but it's likely a case of "until we run out of codes" and most likely at least through the end of 2014. 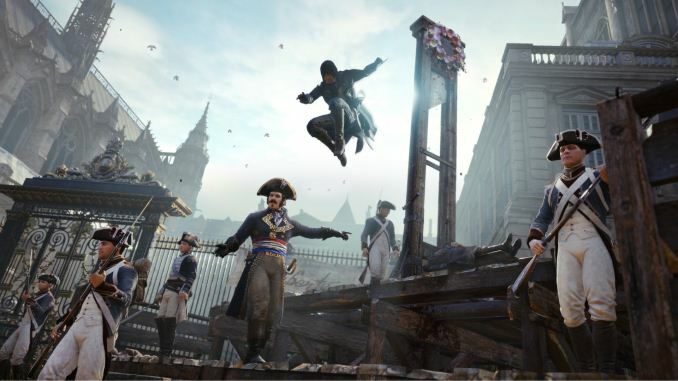 "One interesting note regarding Assassin's Creed Unity is that we've heard it will have a frame rate cap of 60FPS, which is unfortunately becoming more and more common on multi-platform releases." Does this mean that people using high hertz monitors (E.G. 120Hz, 144Hz) won't be able to see that extra smoothness? Sadly, you're correct: games that cap the frame rate at 60FPS (or 30FPS even -- hello The Evil Within, though I think a patch may fix this?) will not show a benefit on higher refresh rate monitors. I'm not sure what the developers are thinking, but it's happening enough now that I'm trying to call it out when I see it. Titanfall was locked to 60FPS, and hacks to unlock the rate also affected the mouse input. I think Ubisoft has a few games that have had a 60FPS cap, mostly console ports.